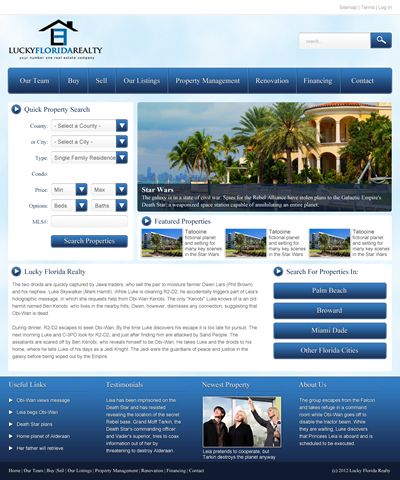 This design was one of three layouts created for a realtor/real estate company in Florida. 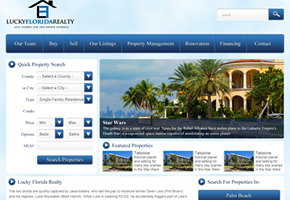 The market for real estate is pretty saturated, and they needed sometng that would help their real estate company to stand out from the rest of the businesses in the industry. Also, the caliber ofweb sites in this niche ranged from very poor to very high quality – and my client needed something that could compete at te top-end of this quality curve and showcase properties that were of a higher standard than the majority of their competitors. The resulting design was this layout, which would integrate well into most CMS platforms, including Joomla!, Drupal or WordPress.